iFlyDisk is a network Virtualized disk mapping software, iFlyDisk can mapping some disk/RAID disks on a computer, but the disk source is a disk or a image file on another computer. the virtual disk which you load on your own computer can be used as usual as local. iFlyDisk is fast, safe, reliable and convenient, compared to INetDisk, iFlyDisk is relatively small, but it faster and user-friendly. iFlyDisk also provides a virtual write technology. 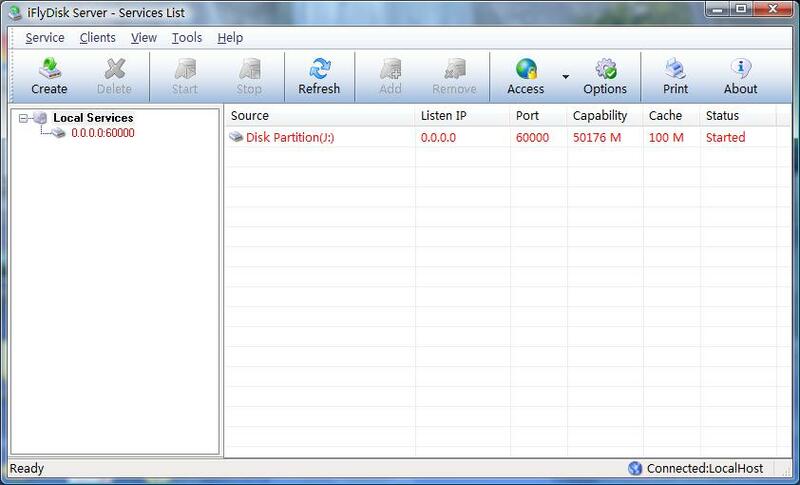 iFlyDisk, is a fast, safe network based virtualized disk mapping software. ...... You can set three kinds of models for the disk to be visited ( full access ,protect ,or refuse ), The protected option allow the file and folder on disks are undeletable, unrenamable, unmovable ,full access option can allows client machines to do anything arbitrarily. the refused option make some clients unconnectable. the client machines which will load the share disk service must be in the scope of the trusty ip list which you setting on server. And also you can provide two passwords to decide a client run in full access mode or protected mode. * High speed, about 8MBytes/S ~12MBytes/S in 100MB ethernet environment. * Mapping partitions on server to other computers. * Mapping a disk image file on server to disk drives on other computers. * Using the virtual disks is all the same as real ones, format, read files, write files and execute programs, etc. Qweas is providing links to iFlyDisk 1.8 as a courtesy, and makes no representations regarding iFlyDisk or any other applications or any information related thereto. Any questions, complaints or claims regarding this application iFlyDisk 1.8 must be directed to the appropriate software vendor. You may click the publisher link of iFlyDisk on the top of this page to get more details about the vendor.